It’s been quite a while since I’ve done a really good stock up on beads, and although I miss having a big order to sort through, I’m actually starting to run out of space for new goodies. I’m looking forward to a time in the not too distant future when I can set about really using up some of the great pieces in my stash and combining a few favorites. In the meantime, I have picked up a few odds and ends, and some of them are really special. My current favorite is a strand of bright red natural horn beads from Fusion Beads. They have a fabulous, warm glow and the color can’t be beat. They’re going to be perfect for some Egyptian necklace recreations. I haven’t had a chance to try these out yet, and I think I’ll need to do a colorfast check before I sit down to work. The mono that these beads are strung in is tinged a bit read, which isn’t a good sign, but I’m hoping for the best. This strand of bone tubes from Happy Mango Beads has been calling to me for awhile now. I love the striped design, which will be perfect for tribal pieces. 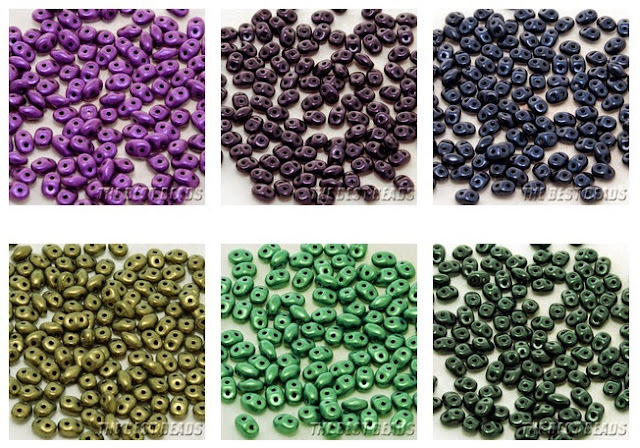 It’s always tricky deciding whether to dole beads like these out a few at a time, or use a whole bunch in a single design. I’m still hoarding these ones until just the right project comes along. I definitely have some fringe in mind, though I still have some experimenting to do with new stringing materials. Finally, I have a new little stash of carved bone ankhs. I was missing having some in my stash just in case I wanted to do a simple Egyptian pendant or two. I love the simplicity of these pieces, which are ready to be embellished or paired with just about anything. I still have some nice tagua slices, which always look great paired with a simple front-drilled pendant, so I might have to whip something together when I need a break from more pressing projects. It’s always enlightening to look back on old designs and marvel at how much our styles and skills have changed. Have you ever compared your first peyote stitch project to one you made years later? It’s usually a big revelation. Of course, beading isn’t the only skill that evolves over time. Today I had a look back at one of my other hobbies, and was amused at what I found. In July of 2010, I posted the first ever Wear It Twice collage: a look at two different ways of styling a statement necklace. The idea was pretty simple, and so was the first set that I made. Since then, I’ve added a lot of different elements to my template, and moved away from the strict color palettes. Fashion collages are still one of my favorite sources for inspiration all these years later. I think that when you make things for people to wear, it’s important to be aware of trends and style concepts. Knowing what jewelry goes well with certain cuts, prints, and shapes is an important part of both designing and selling jewelry. Plus it’s really fun to play with color and experiment with dressing the designs you like. What’s your favorite creative outlet apart from beading? Do you ever mix them? So much for getting things back on track – this week I’m still a bit cramped for time. Normally, I would pick up my handy bead tray and take it to my photography area for a nice crisp photo of the week’s project. Today I didn’t have quite have the energy. With school back in session this week, I’m not quite used to the early morning rush. Today I’m sharing a rare glimpse of my actual workspace, paint stains and all. Right now I’m putting together a secret something using a few new favorites: Czech dragonfly coins, Miyuki drops, and some 8/o Dyna-Mites. I had almost forgotten how truly lovely it can be to weave flat beadwork with just large seed beads, and I’m having a great time with this project. Do you ever have major creative slumps? I find that whenever I’m pouring a lot of energy into a project that doesn’t work out - or turns out to be just plain boring - I get completely drained of creativity, until I don’t want to do anything productive at all. This happened to me at the beginning of September, and I’ve been really struggling to get around it for the past week or so. It took a little time, but I finally figured out a way to work around the creative blocks I was having, and got to working on some new projects that are exciting to sit down to. Right now I’m putting together a secret something using a Swarovski cosmic pendant, and it’s going very well. It feels great to be back to normal again! My top secret project is still on schedule, despite some setbacks and a lot of timing issues. Normally I’d have hours of beading time to myself on school days, but all of our schools are still closed due to an ongoing strike. Hopefully things will get settled - with the appropriate funds going where they are needed - and we’ll be able to resume the ordinary timetable once again. The big reveal is still a few months away, and I’m very excited about sharing the news with you when it’s time. Greetings, beaders! I’m back from my creative break, and things are now back on schedule. What better way to celebrate than with a fabulous giveaway? 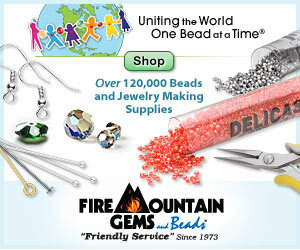 Inspirational Beading’s favorite sponsor, The Best Beads, has recently made a move to Etsy, with a gorgeous selection of new beads direct from the Czech Republic. 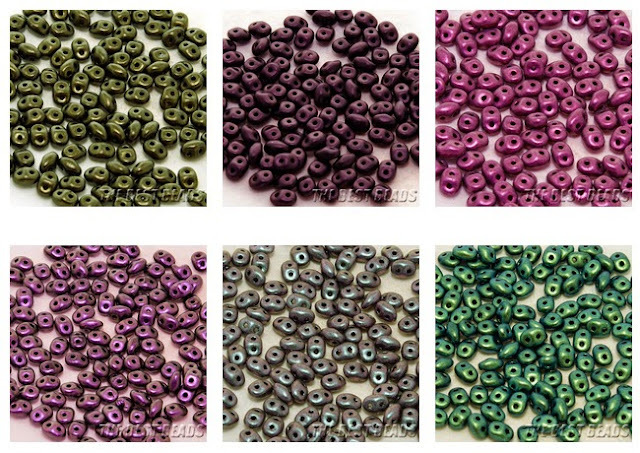 In addition to lovely seed beads, buttons, lampwork and pressed glass, The Best Beads also carries some of the exciting new shapes like pellets, pips, and Super Duos. New Super Duo colors and finishes have recently arrived, including chameleon and metallic suede. The brushed metal look is gorgeous and colorfast – perfect for your favorite two-hole bead designs. If you’d like to try them out, The Best Beads is giving away a $30 gift certificate to one lucky reader! For a chance to win, visit The Best Beads and check out their selection of glass beads and buttons. Then head back here to Inspirational Beading, and leave a comment letting us know which pieces are your favorites. Anything goes! One winner will be drawn on Monday, September 22nd. This giveaway is open to international readers. I’m way behind in my goals this week for beading and for blogging. It’s one part day job overload, one part back to school shopping, and one part beader’s block. (It’s a good thing the shopping part was really fun, because our teachers have been on strike since June and the actual going back to school is postponed until further notice). Over the past week or so, I’ve been trying to recreate the semi-freeform mosaic cuff from a while back, using Java glass, vintage white hearts, and 8/o seed beads. I don’t know if it’s the materials or just bad luck, but I haven’t had any success. Last time, the beadwork just fell into place, but this time around I’ve had to take apart several attempts and start from scratch. I’ve still got two of my four failed starts to frog before moving on to something else. This project has taken up so much time, and I don’t want to continue fighting with it when there are more exciting projects to make. I’m hoping that I’ll find my motivation again once I get some new beads on the tray. It’s too bad, because the colors are pretty awesome. I’ll have to keep them in mind for a fall themed project in the future - probably a necklace.